Have your children succumbed to the [amazon_link id=”B002NBN7CC” target=”_blank” ]Silly Bandz[/amazon_link] craze over the last couple of years? They’re small, rubber and hoping to conquer the world. Silly Bandz are colourful, elasticised, silicone wristbands that come in a variety of shapes and are worn like a regular bracelet. They can be stretched to go on to the wrist but always revert back to their original shape. They come in themed packs, like zoo animals or the alphabet and, most recently, even ones shaped like Canadian singer Justin Bieber. I will not waste money on Silly Bandz. They are indicative of the trends involving cheap products marketed to children that do nothing for our environment or our kids. I went to their website to see if there was any redeeming environmental qualities, but no, there is not. 3. Are Silly Bandz made out of recycled junk, like latex? No. Our bandz are made out of 100% medical grade silicone. 4. Does a kitten cry when someone breaks a band? We can not confirm or deny this. 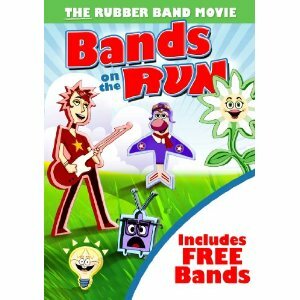 We were sent a movie called Bands on the Run: The Rubber Band Movie. After accidentally falling off a truck, five rubber bands – Roxie (rock star), Daisy (flower), Edison (light bulb), Ray (TV) and Amelia (airplane) join together to make their way to the toy store and onto the wrists of three happy children! My daughter was really excited when we opened it, as it had free bands inside (knock off versions). I put it away not in the mood to review it. This weekend, she begged me again. I told her she would have to watch the movie if she opened it and let me know how it was. She didn’t finish the movie. She said it was stupid. I don’t have the time to confirm this. I can tell by looking at it. It is why I have put off writing this review for so long. It is just an attempt to jump on the Silly Bandz bandwagon, and I want nothing to do with it.